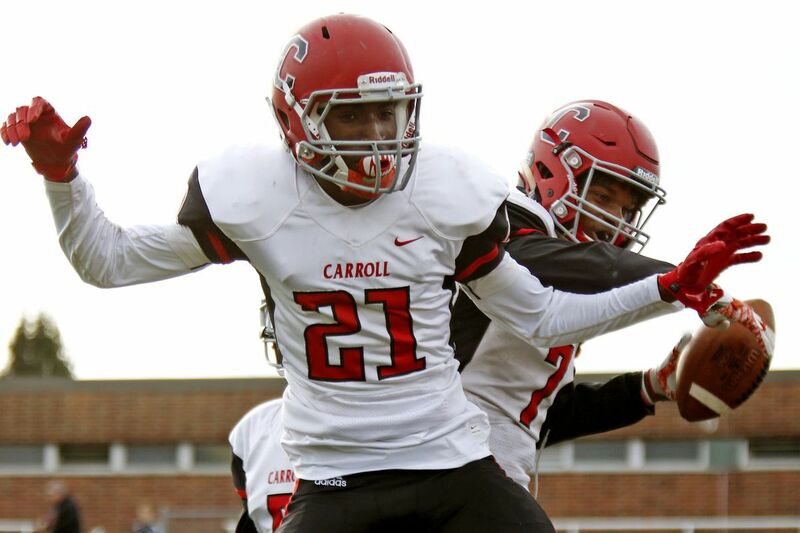 Archbishop Carroll’s Carlon Brown (21) and Dahmir Ruffin celebrate Ruffin’s touchdown against Archbishop Ryan in a Catholic League Class 5A semifinal last season. Archbishop Carroll has selected Kyle Detweiler as its new head football coach. Detweiler, 29, served as Central Bucks South's defensive coordinator for the last six seasons. He was a two-way lineman at Souderton (class of 2006) and went on to play center at Muhlenberg. "Just by stepping foot on campus, I could tell that this school was a great fit, and I am beyond excited to get underway with preparation for the 2018 season," Detweiler said in a press release. "I am really looking forward to connecting with all of our players and starting the process of building this program toward continued, long-term success." C.B. South switched to a 4-2-5 defense the last two years. The Titans allowed 16.7 points per game last season while posting a 7-4 record (4-2 in the Suburban One League Continental Conference). "He was thrown into being a defensive coordinator pretty early in his coaching career," C.B. South coach Tom Hetrick said. "He put a lot of time and passion into it. He certainly has what it takes to be a head coach." Dan Connor, a former standout linebacker at Strath Haven and Penn State, stepped down as Carroll's coach after two seasons to become the defensive coordinator at Widener. Detweiler, of Havertown, was scheduled to meet with the Carroll players and parents Monday night at the Radnor school. The Patriots went 3-8 overall and 0-6 in the Catholic League Red Division last season.